I hope this reminder finds you well, rested, and ready to get back. I hope you’ve been working hard this summer to ensure that you come back conditioned and ready to start a successful volleyball season. 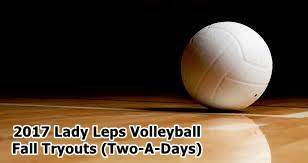 Volleyball tryouts will begin Tuesday, August 1, 2017. We will have two sessions a day. Everyone must attend both sessions every day. Sessions will be 8:00 a.m. to 11:00 a.m. and 12:00 p.m. to 2:00 p.m. Pick up @ 7-7:30am and drop off 2-2:30pm. Please let us know by July 28th if you need transportation. Once you are appointed to a team you are committed for the duration of the season. Regular season runs thru the last Tuesday of October. You will be expected to be at every practice, every match, every team meeting, and anything else that might require the team’s attendance. MAKE SURE EVERY PAPERWORK IS SIGNED and ready to turn in…double check all lines where signature is required. You may not participate in any activity until all paper work is on file with our Athletic Trainers. Remember, not having the proper paperwork is not an excuse for missing tryouts. Thursday, August 3, 2017 @ 6:30 in the VVHS Gym.